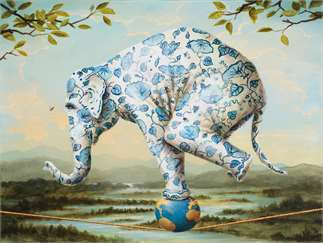 The California Museum of Art Thousand Oaks will present A Collection of Rarities, a solo exhibition featuring the contemporary realist painter, Kevin Sloan, in conjunction with the opening of its new location at The Oaks Mall. on Thursday, November 8, 2018. The exhibit runs through February 17, 2019. The museum will feature a series of family programs in conjunction with the exhibit, including a live falcon show, poetry readings and floral arranging activities. Visit www.cmato.org for additional details. Cabernet, Canvas, and Color Workshop at Art Trek, Inc.